The Imixs-Report plug-In is an Eclipse Plug-In to define business reports for the Imixs-Workflow engine. A report aggregates and transforms a collection of WorkItems into a custom output format (e.g. XML, JSON, HTML, PDF, …). Once a report was created with the Imixs-Report Plug-In, it can be uploaded to a Imixs-Workflow instance via the REST Service API. Reports are stored in a file with the extension “.imixs-report” and can be added to any existing Eclipse project. To create a new report definition add a new file with the extension “.imixs-report” into a project of the Eclipse Workspace. Opening a report shows the Imixs-Report Editor. The editor provides Input-Fields to define a Lucene search statement, defining the result set of the report and an optional Attribute List. The “XSL” section of the Imixs-Report Editor can be used to transform the result set of a report in any kind of output format using the “Extended Stylesheet Language”. Once a report was created with the Eclipse Report Plugin it can be uploaded unisng the Imixs Rest API. Each report is identified uniquely by its report name which is equals to the file resource name. If a report of the same name already exists in a Imixs-Workflow instance the report will be updated. When a report is executed, a result set of WorkItems based on the search statement and attribute definition will be generated. The result set of a report can be requested in different formats (e.g HTML, XML, JSON). 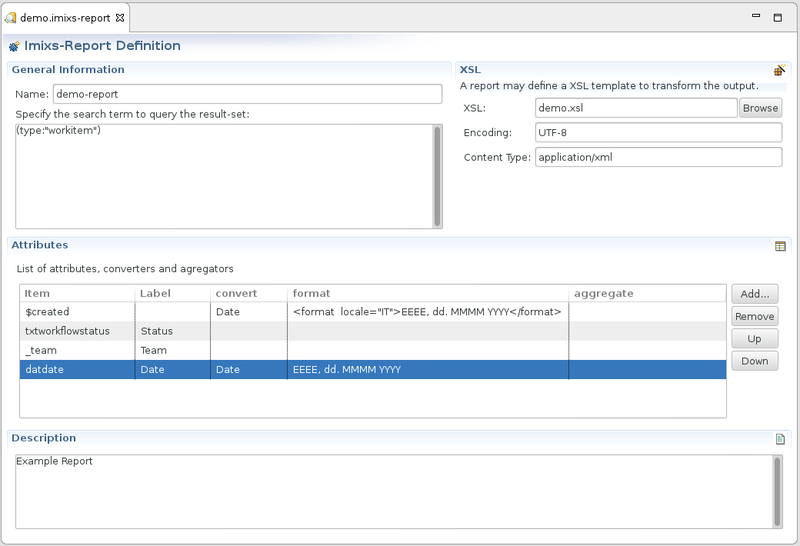 Find details about the Imixs-Report Rest Service API in the section REST API. To remove an existing report use the Imixs-Admin Client. Each report defines at least a Lucene Query. The query selects the result set returned by a report. This example query will select all running workitems in the worklfow group ‘Ticket’. In this example the URL contains the parameter “1=5130” which will be inserted into the query statement during the report execution. Each report definition can include an optional attribute list. The attribute list defines the elements to be included in the result during the report execution. The attribute list allows you to customize the report in various ways. Note, that WorkItems processed by the same workflow can consist of different item values. To ensure that all entities returned through a report issue the same content, defining an attribute list is mandatory. If no attribute list is defined, all item values of a workitem are included in the result set. The first column defines the name of the item value to be returned by the report. This will select the embedded item value ‘amount’ from the item with the name ‘_childItems’. The column label can be used to define an optional label which is used when the result is transformed into a table format (e.g HTML). This example formats the a date value into ISO Date format. The optional attribute ‘locale’ can be used to format dates in a country specific way. Find more details about how to format a date value in the Java Date Format Patterns. The format definition can also be used to format the output of currency and number values. Find more details about how to format a number in the Java Formating Patterns. In case the value is not from the specified type (Double, Integer) the value will be converted into a double or integer object. In case the value can not be converted the value will be reset to 0. It is also possible to adapt the item value by defining a TextAdapter. The Text Adapter is a feature of the Imixs-Workflow engine and can be used to convert item values in custom String values. This attribute definition will extend the JPQL result with all embedded Child Items stored in the attribute ‘_childItems’ and containing the item ‘amount’. To transform the result of a report definition into various output formats a XSL template can be added into each report. These parameters are equals to the corresponding parameters of the Imixs-REST Service interface. Internally a report is stored in a document with the type ‘ReportEntity’. The following attributes are stored in report definition entity.